Greece is a lovely country, amazing views, super delicious food and very hospitable people. Sadly, though, like in any country you will find bad people. Last December when I visited with a group of sisters we had a great time, it was fun we explored the city and we did enjoy the food. However, during the trip one of the girls was robbed. We are not sure exactly how since one minute she paid in a shop and the next her wallet was gone. I do have my suspicions. We were walking around Monastiraki and I believe that one of the shop assistants did it while we were waiting for the rest of the girls to finish their shopping outside. We were sat on the steps when she leaned next to my friend. The following day we went to ask around and I can definitely say she was shocked to see us here, one day super polite and the next not so much. We weren’t rude or anything just asked if they had seen it around. I have never had a case before where I was robbed while traveling but there is a first time for everything. Sadly it kind of spoils the trip of course as well as all the stress and hassle. The next day we went to the police station near our hotel and while waiting there they told us we are in the wrong station. They cannot issue a document or report it to them. You have to go to the Tourist Police. 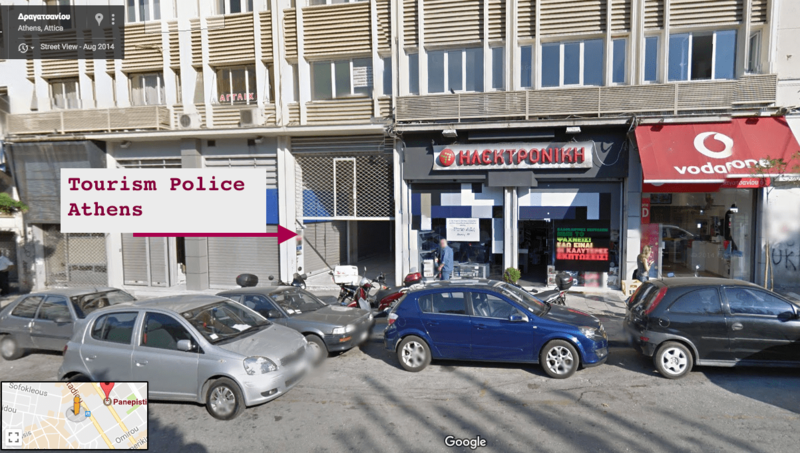 The Tourist Police in Athens is in Dragatsaniou Street near Panepistimio metro station, not far away from Syntagma and Monastiraki, you have to go there to receive a report for your insurance company. Interestingly there was no sign saying the Police was there or anything else. And currently while looking to find the address for this post, I couldn’t find the location of the office we went to! Many times in Greece things change overnight and the internet doesn’t catch up fast enough. I found this list below with the details of the other Tourist police stations in the government Police website. The day we went there were protests so the metro along with all the streets in that area were closed. Police were everywhere and it was a totally surreal experience. Masks, guns, and vans totally out of a movie scene. Even the Tourism Police had their shutters down as usually, they are the first to get vandalised. Oh, the Greek experience! At the end, we received the paper as proof of the theft and we were done in 15minutes. The officers were pretty chilled out and it was definitely an occurring case since apparently there are many pickpocketers around. They won’t do anything to recover or investigate sadly as I feel they just know it happens and have given up. Always have extra cash and card in another place other than your wallet. Many times I will have cash in my wallet but also in my in the front pocket of my jeans. Have a copy of your documents and card stored online with a password for protection. You don’t want to get it in the wrong hands but you want to be able to access it when needed. So extra secure encrypted apps can help. I usually never carry my passport with me and I leave some cash in the hotel room in a safe spot. At least I know I will have enough for food or other necessities. Use skype to call your bank and cancel the cards immediately. I always have extra credits in my skype account. Paypal can also be a good option if you need to buy tickets etc. You can pay via PayPal where you don’t need your credit card. Have travel insurance, I know some people are not keen on insurance but in emergency cases like this it can be a life saver. Many cards can issue you with an emergency new card within 24 to 48 hrs which is super impressive. My friend received hers in 24hrs, it is consolation at least. I read this article in preparations for my trip to Athens today and it still happened to me. 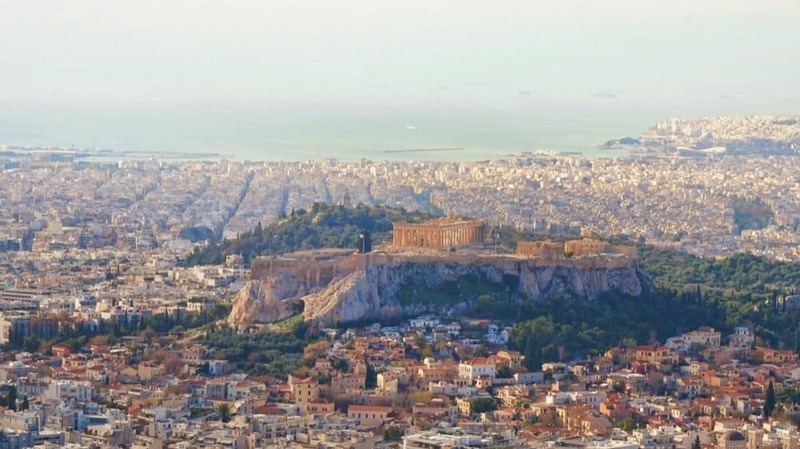 I had stored my luggage on the luggage racks riding the train from the airport to Syntagma station. A few stops before Syntagma, there was a mad rush of people entering the train due to rush hour. When I went to retrieve my luggage, there were two women standing in front and wouldn’t get out of the way. Next thing I knew, my wallet, which I had put deep in my side pocket, was gone. My wife had actually caught one of the pickpocketers attempting to unzip her purse while she was retrieving her bag. I was so concerned about my luggage that I didn’t take proper precautions about my wallet. Oh well, you live and you learn. Don’t think I’ll be riding the train back to the airport even though I bought a return ticket for 2. Jimmy, I am so sorry to hear this happened to you. 🙁 I hate it because it gives such a bad impression that they do it. I hope you still enjoyed your time there. Just got back from 8 fabulous days in Athens and Delphi. However, heading out to the air point on the metro between Sigrou Fix and Sintagma stations I had my pocket picked. I lost $100 and 40 Euros. My wife and I are sure we were set up by a team. First they took a run at her. Her purse was over her shoulder and she felt it move and she quickly ripped it around in front of her and a woman suddenly back away saying: “no no no.” The subway car was full of people and it was jiggling so I took my hand out of my front right pocket where my wallet was to hold the grab bar. When people got on at a stop a man bumped into me. When we got off at Sintagma my wallet was gone. THis all took place in 15 minutes. Fortunately, both of us have traveled in Southern Europe and we had split up our money and cards and our passportes were in our Rollie’s. I cancelled my cards at the airport with my smart phone and the help of my son in the US who had all my passwords. The advice above is very good – have backup plans if you are picked. They haven’t “given up”. It’s just impossible to investigate a petty crime. Just because you have your suspicions of who did it, it’s not something that can be proven in court. They *do* have sting operations, however. They recently caught a sizeable gang of pickpocketers. I agree it is not possible to investigate everyone.